Many organisations are placing increasing importance on improving efficiencies, including to their internal culture that ultimately impacts the quality of service delivered to customers. Overcoming internal communications issues, such as overuse of emails, has become one of the main issues that organisations struggle to rectify but without effective internal communications, large organisations are hard-pressed to build employee engagement, provide training or build teamwork. Using analytical dashboards allows you to track present information and measure engagement with internal communications. 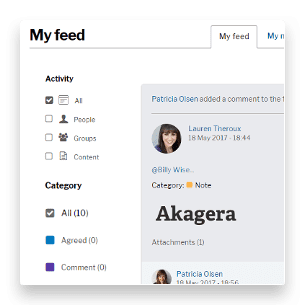 The ability to add feeds that display up to date information allows you to contact the people with the right messages at the right time. Use workflows, version control, document locking and archiving to control the process of corporate communications. Gone are the days of pushing the same messages to everyone in a one size fits all approach. Users are receiving sophisticated targeted communications everyday whether it be on their smartphone, an app, digital signage or computers. You need to be able to cut through the noise to connect with your audience. Internal communications isn’t just limited to just communicating with your wider audience, it’s also about how you communicate with them through content. Present your content creatively with widgets, page templates and layouts so you can design and position your content quickly with ease. Our product makes complex corporate communications easy. Create, review and publish engaging content in no time. Notifications- Ensure users don’t miss any developments which will increase their productivity and effectiveness.